We like to think of writing, visual arts, music, as this free-flowing beautiful thing that should be open to all. It's pleasant to think of the lone artist up in an unheated garret waiting for the muse to set in and reveal artistic brilliance. Unfortunately, it doesn't really work that way. To begin with, the public, for whatever reason, seems to think it's OK to get free art for "exposure." Can you imagine going to a brain surgeon and asking for a free procedure in exchange for a good Yelp review? I don't either, but it doesn't seem strange to ask the same from painters or writers (or editors, for that matter). If it's important, it's worth paying for. Another misconception is that artists just, well, just flop around and wait for inspiration. It is fun to not have a plan or deadline for ideas, but it isn't conducive to being an artist. In the words of Jack London “You can’t wait for inspiration. You have to go after it with a club.” The best, most prolific artists gave themselves a schedule and then stuck to it, working around day jobs, families, and everything else adults have to deal with. What is all comes down to is being a professional isn't just about having an excuse to get business cards. An artist's professionalism actually serves to protect the art. It's tough to be productive when you not only give away your art, but it costs you time and money in the form of training and supplies you aren't being reimbursed for. It's hard to maintain any sort of continuity when creating is something that's done when the mood strikes. Here's a hint: The muse tends to show up more often when we're working. I've had the pleasure of working with the publisher of +Crystal Lake, a publishing house located in South Africa. +Joe Mynhardt has taken his company from humble beginnings to a solid company with titles from people like Jack Ketchum and Neil Gaiman. 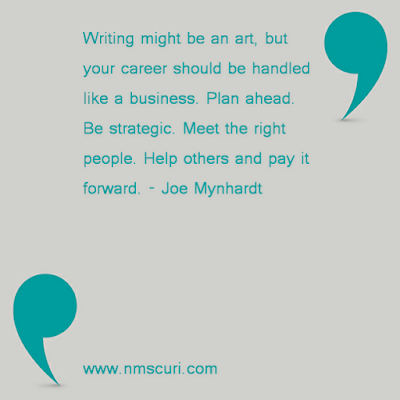 Joe gave an excellent piece of advice to a writer who is just starting out: Writing might be an art, but your career should be handled like a business. Meet the right people. Help others and pay it forward. It's certainly worked for him. I think it'll work for you, too.